Hello again! 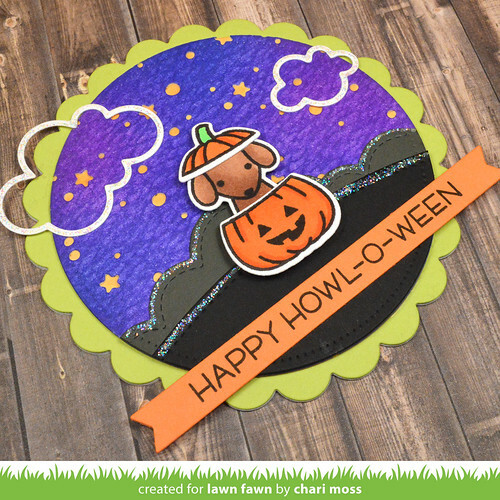 It's day two of Lawn Fawn Inspiration week and today we are featuring what might be my most favorite set from the release Happy Howloween (for obvious reasons) and the new Stitched Tree Border Dies. 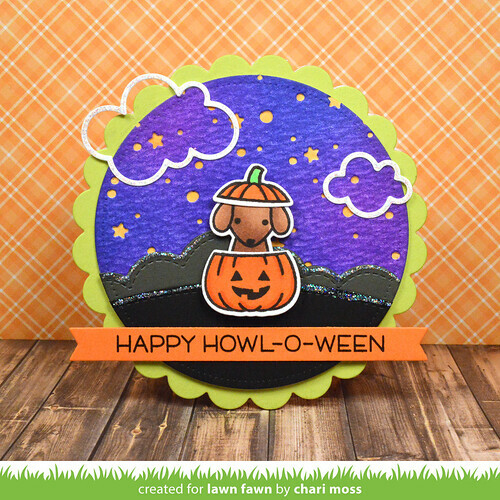 I was SO excited when I first saw the Happy Howloween set... or as I like to call it Penny in Costume! This little baby looks just like my baby (yes she is our baby...no kids here, just a little weenie dog). If I could set her in a pumpkin and capture this cuteness I would but she wouldn't have any of that so a stamp is as close as I'm going to get. I stamped her and the pumpkin and colored them with copic markers. I cut a pieces of distress cardstock with a circle die then blended wilted violet and blueprint sketch distress inks. Then I die cut it with the Snowy backdrops die and layered over a sunflower cardstock circle to create a starry night. I used a Simple Hillside border die with Black Licorice cardstock and Puffy Cloud border die with Storm Cloud cardstock. I added a few Simple Puffy Cloud Frame die cuts and layered the whole scene on a scalloped circle. The sentiment fits perfectly on one of the Sentiment banners cut from Fake Tan cardstock and I finished it off with some stardust stickles along the edges of the clouds, ground and tree line. My second card features the Stitched Tree Border dies. As soon as I saw these dies I thought it would be awesome to die cut them from Perfectly Plaid Fall paper. 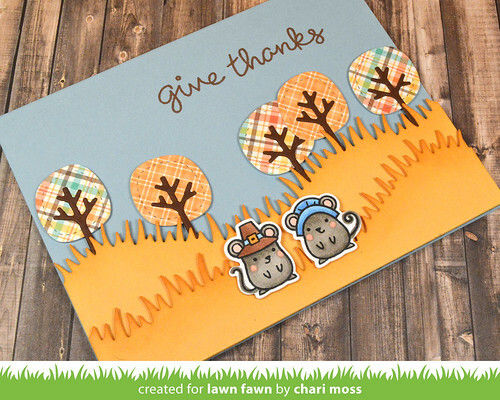 Be sure and check out the Lawn Fawn blog for more projects and giveaways! Love all these cards! I love the color schemes and those new tree dies, can't wait to get those and that plaid paper. Your cards are so cute Chari. Love the little dog in the pumpkin.